Raisin water has plenty of vitamins and minerals, which are beneficial for health. It has high amount of iron, potassium, vitamin and anti-oxidants. 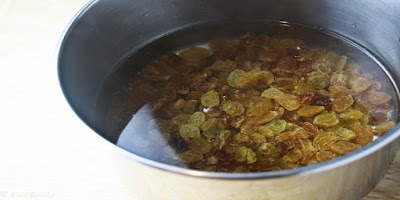 Keep a handful raisin in one cup boil water for overnight. Heat it little in the morning and drink it with empty stomach. Weakness: Raisin water has amino acid it give energy. It is very helpful to reduces tiredness and weakness. Constipation: Raisin water work like natural lacerative. Drink water of raisin in early morning with empty stomach it clean the stomach. Acidity: Raisin contains soluble fibers, which cleans the stomach and removes gas and acidity. Healthy Kidney: Raisin water contains potassium and magnesium. It removes toxins from the body and keeps it healthy. Anemia: Raisin water has iron, copper and B complex. It is beneficial in anemia and makes red cells healthy. Cancer: Raisin water contains anti-oxidants, which makes body cells healthy and protects us from cancer. Infection: This water has polygenic phytonutrients. Its anti-bacterial quality protects us from cold-cough and fever. Vision: Raisin water has vitamin A, beta carotene and beneficial for eyes. It increases vision. Weight Loss: Raisin water improves metabolism and fat burning process. It is helpful in weight loss. Strong Bones: Raisin water has high amount of calcium. It strengthens the bones. It protects us from arthritis and gout. Healthy Skin: Raisin water contains phenol and anti-oxidants, which makes skin hydrate and repairs the damage skin. It makes skin healthy and soft. Healthy Hair: Raisin water provides necessary vitamin B, potassium and anti-oxidants. It makes hair healthy and shiny.